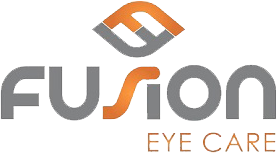 I would like to personally thank you for visiting our website and giving me the opportunity to tell you about myself, fusion eye care, and our vision. I have gladly called Raleigh home for the past 25 years. I graduated from North Carolina State University with a Bachelor of Science in Microbiology. I attended Salus University (formerly known as Pennsylvania College of Optometry) in a small suburban town outside of Philadelphia. I chose the field of optometry for a number of reasons including caring for the bodies most cherished organ (the eyes) and peoples most precious sense (sight). During my time in school, I completed externships at the Queens VA Hospital and the Brooklyn VA Hospital. It was during my time at these facilities that I developed a strong understanding of Ocular Disease, therefore, realized the importance of comprehensive eye care. After graduating in 2007, I did not hesitate returning home to Raleigh, NC where I have been in practice ever since. 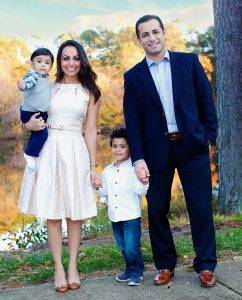 In 2014, my wife and I decided to follow our dreams of opening a private practice in Raleigh, NC where we could serve the local community with the highest quality of care from our respective professions. Our practice is truly unique because we have integrated two necessary services, Eye Care & Dental Care, into one convenient location. This integration would lead us to fittingly name our practices Fusion Eye Care & Fusion Dental Care. Our mission is to provide the highest standard of comprehensive care, using the latest technology, in an upbeat, family-oriented environment. In today’s age, I understand that patients have many options once they receive their prescription to purchase glasses and contact lenses online or at discount stores. In an effort to serve my patient’s with the highest standard of care, I find it necessary to not only provide a comprehensive examination but to also provide the necessary devices to meet their needs of clear vision. At Fusion, I have created a new practice model that is “taking the business out of eye care.” Our success is primarily based on the service we provide and less on the products we sell. In my practice, I complete the majority of the examination with little reliance on technicians and assistants. I attempt to answer every patients question(s) to the best of my ability, effectively communicate with my patients primary care physicians, and refer to only the best surgeons in the area when necessary. 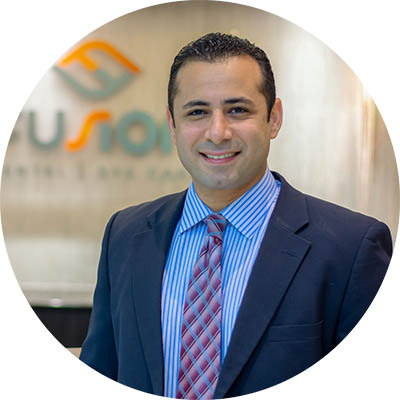 As practice owners of Fusion Dental Care and Fusion Eye Care, my wife and I make ourselves available to address questions or concerns that you may have. If you are currently a patient of ours, we thank you for making our vision of eye and dental care a huge success. If you are new to the area or would simply like to find a new eye doctor or dentist, we would love for you to stop by so that we may show you our office and answer any questions.